Regardless of whether you’re a seasoned investor, or someone just getting started, it often helps to review the most basic fundamental principle that underlies all of investing: compounding. If you truly understand the power of compounding, then you recognize that beyond any other force, it is time that exerts the greatest influence on your investment portfolio. Saving for retirement requires a lot more than just predicting which way the stock and bond markets are headed, or jumping on the latest technology bandwagon. It requires a plan, and it requires self-discipline. Sure, the task becomes a little easier if you happen to be good at reading markets, but the real key to creating generational wealth is time. Because it is time that allows the process of compounding to unfold. One of the best ways to think about money is as if each dollar that passes through your hands has the potential to become an employee. If you spend that dollar unwisely, on say, a jet pack, it leaves your company and you reap no benefits. But if you put that little $1 employee to work, it has the potential to earn you money for the rest of your life, and perhaps the lives of future generations. When you start putting money to work, you soon find that an interesting thing happens … You end up with new employees (dollars) that were created by the old employees you put to work. What you do with these new employees is up to you. If your jet pack happened to break down, and you need another one, then those employees will be lost. But if you put those 2nd generation employees back to work, they can go on to create 3rd and 4th generation employees … and on and on. Meet these three simple conditions, and you too can amass great wealth (tip: later in the article we show you how easy it is to become a millionaire). Okay, now that you have a conceptual view of what compounding is, let’s go through a few examples to see compounding in action. The best way to illustrate compounding and the incredible role that time plays, is to compare the fortunes of two ambitious investors, we’ll call them Early and Late. Early understood the value of compounding as a young lad, and his goal was to tuck away some money for retirement as quickly as he could, and then be done with it. At age 20, he began saving $5,000 per year, but then after eight years, he said screw it, I’m done! Late didn’t have quite as good of a grasp on compounding as Early, and as a result, he didn’t get started investing until he was 28. At age 28 (mind you this is the same age at which Early stopped his contributions) Late began to invest the same $5,000 per month. He continued doing this all the way until he retired at age 65. Is that the result you were expecting? Did you think that Early, who only contributed for 8 years, would have more money at retirement than Late, who tucked away the same amount of money each year for 38 years. Isn’t that frustratingly awesome? Early only invested a total of $40,000, but because he invested it early in life, he had time on his side. Late ended up investing nearly five times as much as Early ($190,000) but because he was late to the party, his investments just didn’t have the time they needed to truly shine. So not only did Early wind up with a more prosperous retirement, he had an extra $150,000 (the excess amount that Late contributed above what he did) through the years to spend on vacations, cars, jet packs and whatever else he saw fit! Talk about working the system! The point here is not to berate you about not beginning to invest at age 20, it’s to emphasize the fact that you need to begin NOW, and you need to contribute as much as you can to your investments. Why do we emphasize as much as possible? Because as you can see from the table above, money you contribute now is worth much more than money you will contribute down the road. That’s just simply how compounding works. But chances are you’re older in life, and want to get on the fast track to financial independence. Will compounding play as big of a role for you? The answer is yes, and here is another great example that shows why. 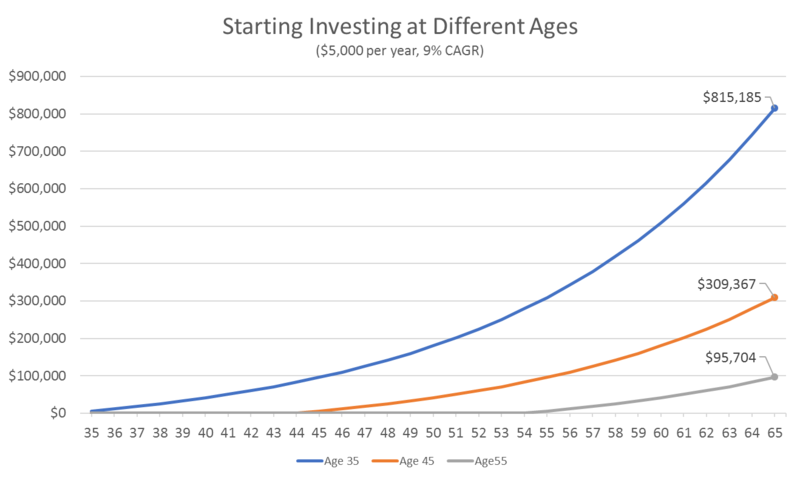 This chart shows the hypothetical portfolio growth of three different investors who begin investing $5,000 per year at ages 35, 45, and 55. Take a moment to study the results. And if you’re already well on the road to retirement, consider cranking up those contributions a notch … never forget that a dollar contributed today will always be worth more than a dollar contributed next year, and so forth. It takes time for dollars to multiply. There’s an old saying in the investment world that goes like this: In the long-run, we’re all rich. As you can probably guess, this is a nod to compounding, which, over the long-run, will make us all rich. But then John Maynard Keynes came along and aptly pointed out that, “In the long run, we’re all dead.” Touché Mr. Keynes. So the real key to compounding is this: Get Started Early. If you do things right, you can begin the creation of a snowball effect of wealth that has the potential to last generations. But if you don’t begin while you’re young, you won’t be around long enough to see the fruits of your labor. 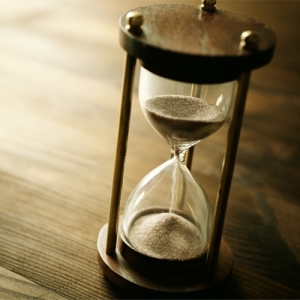 Compounding requires time … and unfortunately, that’s the one thing we’re each running out of on a daily basis. Admittedly, being a millionaire isn’t what it once was. Nowadays, you need to be a millionaire just to afford a decent standard of living during retirement. But becoming a millionaire is still an achievement most investors are looking to accomplish, so let’s plan out a few ways to get there. In the table below, we’ve created a matrix that shows you based on your age, and the rate of return you achieve, how much you need so save (and invest) each month in order to have a million bucks by the time you’re age 65. *The percentages at the top of the table reflect rates of return. 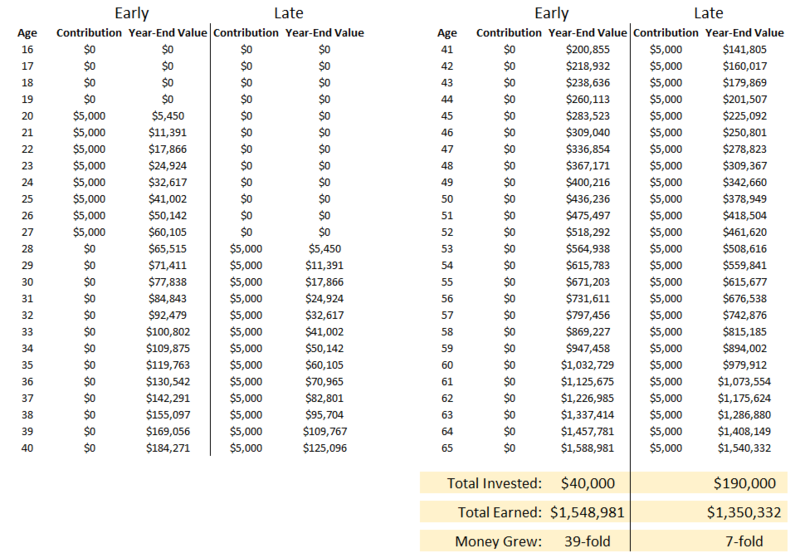 To find out how much you must save each month to reach $1 Million by age 65, find the intersection between your age (left column) and the corresponding rate of return you hope to earn. It should be apparent right off the bat, but notice that the younger you are, the less you need to tuck away each month to hit that million dollar mark. Also notice the big role that investment returns play. Someone who is 40 years old needs to save $1,663 per month to reach a million dollars if their money earns 5%, but that figure drops to just $903 if they can earn a 9% return instead. Compound growth is a magical thing, that much is clear. Given enough time, compounding will take a small sum of money and turn it into a fortune. But that process requires time, and lots of it. Unfortunately, for us mere mortals, time is of the essence. We’re not getting any younger, and in fact just the opposite is happening. Each day that we don’t put money to work is a day that we’ll never get back. While that may not alarm you right now, as you become older and wiser, the urgency will become clear. For those who do not have the opportunity to go back in time and begin their investing careers at an earlier age, the next best thing you can do is focus on earning the highest and safest returns possible. A higher return will cause your investments to compound at a faster rate, allowing you to cover more ground in less time. But please be aware that for the most part, investing to achieve higher returns requires taking on more risk. That is not always the case, but it’s a relationship that holds true more often than not. 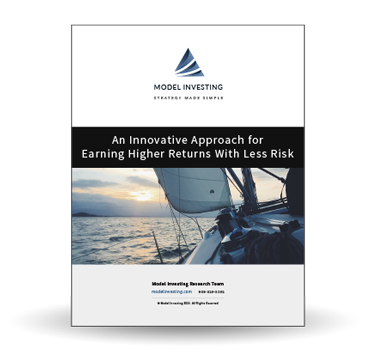 In your search for higher investment returns, let us offer one last piece of advice: Your goal should not be to earn the highest overall returns possible, but rather the highest risk-adjusted returns. That is, your goal should be to earn the highest reward you can, per unit of risk. In order to do this, you’ll want to compare the Sharpe ratios of different investments/strategies that you consider. 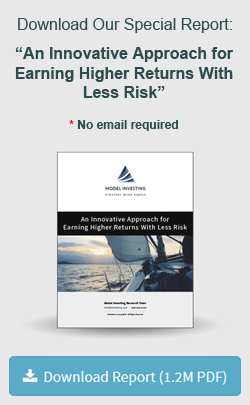 The Sharpe ratio is the industry standard measure for assessing risk-adjusted returns. By focusing on risk-adjusted returns, as opposed to overall returns, you’ll ensure that you don’t expose yourself to too much risk on the path to retirement. That, in turn, will reduce the chance that you experience a major setback, which is the Achilles heel of compounding.